INGROWN TOENAILS – WHAT CAN I DO? 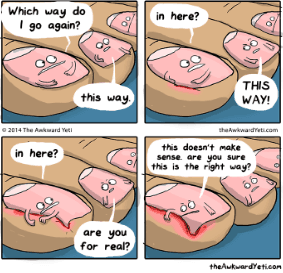 Ingrown toenails can be fickle little things and are often very painful. 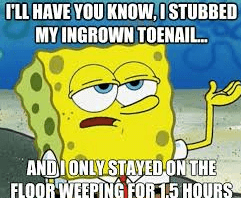 Ingrown toenails happen when the edge of the nail or a nail spike pierces the skin surrounding the nail and continues to grow in the wrong direction. It is most common in the big toes, however can also occur on the other toes as well. If the nail continues to grow into the skin, it will cause pain and may even become infected. Signs of infection include red, hot or swollen skin, pus and pain. Often as the nail digs itself deeper into the skin, a small lump may be seen on the edges of the nail. This occurs as the skin in not able to heal normally due to the constant ‘digging in’ caused by the nail, resulting in what’s called ‘hypergranulation tissue’. This tissue can overlap the nail and also cause pain. It is important to protect a painful ingrown nail until you consult a podiatrist to prevent it from getting worse. In some cases, a podiatrist will be able to remove the nail spike quite easily. Podiatrists are armed with the tools required to be able to remove the nail spike if possible relatively easily, through the use of nail clippers and a scalpel. Often, podiatrists will place a very small piece of medical foam under the edge of the nail to attempt to lift the nail and limit the amount that it grows into the skin. When there is pain and infection, it makes it a little more tricky and we can use other treatment options. There is a procedure that can be performed called a partial nail avulsion procedure. It involves injecting a small amount of local anaesthetic into the toe in order to be able to remove the part of the nail that is ingrown without pain. Prior to this, you may be sent by your podiatrist to your GP in order to be prescribed antibiotics to treat any infection present. Infection can affect the ability of the local anaesthetic to work in order to make your toe go numb. Therefore you be required to visit your GP at before your procedure. It is important to note that once the local anaesthetic has kicked in, you may still be able to feel pressure, but will not feel pain. The toe is always checked before the procedure begins to make sure that it has gone completely numb. Once we are happy that you will be comfortable, we begin by lifting the affected nail to detach it from the nail bed underneath. We then cut the nail and remove the ingrown section. Following this, we apply a chemical called phenol to the nail bed, which kills the nail to prevent it from growing back in that particular spot. Most of the time this is effective, however there have been some cases where podiatrists have had to repeat the procedure if the nail has not died. Finally, the toe is dressed appropriately. At Watsonia Podiatry, we see our patients the day after their procedure to re-dress the toe and check that everything is ok. We give patients a dressing pack with everything they need to dress the toe every second day and recommend salt water foot baths before each dressing change. We then schedule another appointment in 2 weeks time to re-assess and make sure everything is on track and determine whether we need to see you again at this appointment.